Papers helps you organize your work in progress with a dedicated space for your manuscripts. 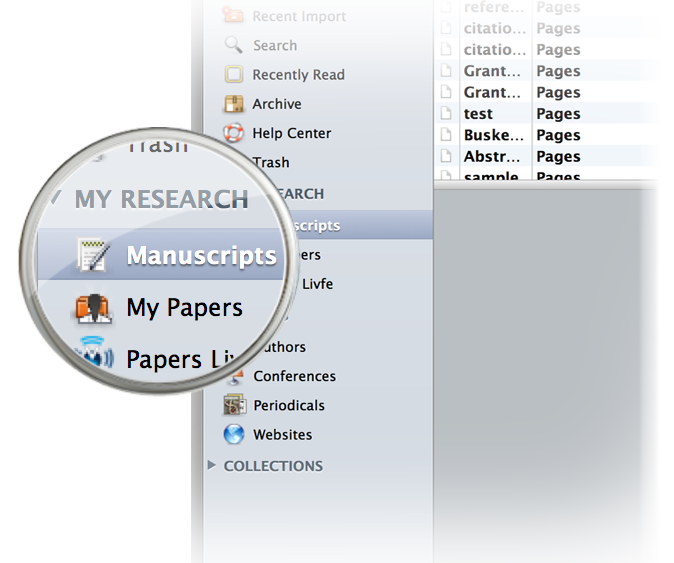 As soon as you insert a citation in any document, it is automatically saved to My Manuscripts under My Research in Papers. Papers has a build in reference manager with compatibility for any application you can imagine. Cite in web browsers, word processors, spreadsheets, or presentations. If a document is saved and you add a citation, it is automatically added to My Manuscripts. If you are using Magic Citations with Scrivener, we made a separate tutorial dedicated to it. The videos below show how you can use Magic Citations in Pages and Word, although you can insert citations in many other applications as well.